Many Medieval Manuscripts Inexplicably Feature Illuminations Of Knights Fighting? The margins of medieval manuscripts include all manner of illustrations you might not expect to find. Sometimes, the illustrations were there by request of the people funding the (very expensive) texts, other times, bored scribes left behind what amounts to little doodles and jokes. The vast majority of the time, the drawings make sense to a modern viewer, insofar as the jokes drawn out stand the test of time (usually thanks to their crudeness) or connect together symbols and images still understood today. 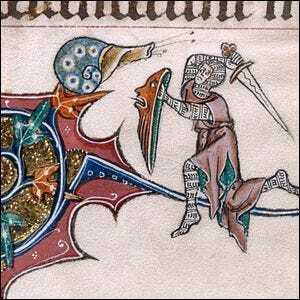 In one particular case, however, there’s a recurrent theme found in dozens of manuscripts across Europe that modern scholars simply have no clear explanation for: illuminations of knights battling snails (and often, for that matter, losing to them). Some scholars have proposed that the snails represent the resurrection, in relation to the raising of Lazarus (of biblical fame). Others have suggested that the snails served as an anthropomorphic representation of the Lombards (a group particularly scorned in the Middle Ages and viewed as the antithesis of knighthood). Others have tried to build an argument that the symbolism represents the struggle between classes. The only thing consistent about the depictions, however, is the frequency with which they appear. At best, the only absolute argument we can make about the snails and knights in the marginalia of old manuscripts is simply that it was some sort of early meme, seen by scribes then copied, transformed, and transferred on to the next viewer. Image from MS 49622, courtesy of the British Library manuscripts collection.